In case you missed the memo, the Google meme, the Messenger selfie filters, the dedicated supermarket aisles and your SOs pouting face….Valentine’s day took place this week. For those that hold bhakti at the heart of their yoga, every️ day is like Valentine’s day. Bhakti yogis look at the world the way we might look at a lover; with wonder, with joy, with devotion, and above all else, with love. They see the divine in everything, and the expression of their love is their yoga in action. By turning their thoughts, actions and behaviour towards the service of this great love at all times, everyday life itself becomes their yoga practice, infusing all acts with joy, love and devotion. The cynics among us – I hold my hand up here, liberal feminist that I am – might see Valentine’s day as a mercenary attempt by a capitalist structure to exploit the human desire for love and belonging by creating a vacuous material symbology to gift and consume in place of the hard work of authentically engaging in relationship, intimacy and connection as a lived reality. In response to this a bhakti yogi might draw a parallel with a yoga practice devoid of devotion. Although people practice yoga asana for all kinds of reasons, without devotion there remains a risk of falling into a self-centred and competitive version of yoga – again, I hold my hand up, I’ve been there – rife with appropriated symbology. Essentially, yoga with its heart ripped out. Yoga is union, and this is so needed right now in a time when smartphones and social media increase our sense of disconnection the more we connect with them, and yet our attempts to disconnect from them give rise to yet further anxiety and stress. How can we achieve this union, to reconnect with ourselves and one another? The Bhagavad Gita, the original love song, tells us that bhakti yoga – a devotional practice – is a sneaky shortcut that circumvents the ego, that selfish ‘I, me, mine’ mentality that tends to dominate the human psyche. By focusing our attention and energy on the good of something greater than ourselves, be it family, community, nature, the universe or your own concept of God, we can access a sense of deeper connection, belonging and a wellspring of love that has nothing to do with notions of being worthy or deserving. Every one of us, in the most literal sense, were made manifest from love. Almost every yoga class includes sun salutations, and I find the sequence of movements lends itself perfectly to the practice of devotion. It is the embodiment of a moving prayer. – Every inhale is an in-rushing of prana. Gifting the body essential breath, fresh oxygen, the raw material for life, our animating force. With this in-breath comes expansion, lift, movement upwards and outwards; a joyful full body expression of gratitude, a present moment awareness of being alive and of this world. Filled with ecstatic grace. For what could you be more thankful? – Every exhale is a return of this life giving breath back to the world, a surrendering, an acknowledgement that this body and life are temporary gifts that we can use to make an offering in the service of love. A bowing down. And in the pause at the end of the out breath, a relinquishing of our sense of self, a letting go as we are reabsorbed into the present moment, of simply being. Daily life makes demands of us that make it difficult to stay present in a devotional mindset. As often as possible, dedicate a task, a thought or an action to the benefit of someone or something other than yourself. This might be doing the washing up with the thought of how it will be of benefit to those who share your home. Or it could be doing something that makes your own heart happy, so that you can transmit that love and happiness to those around you. No one can pour from an empty cup. 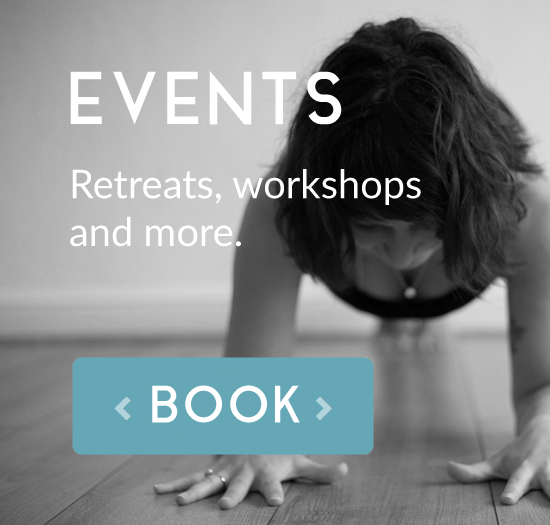 If bhakti yoga is something you would like to know more about and experience for yourself, the inaugural Bhaktifest is taking place at Falmouth Yogaspace this coming Sunday, just a couple of tickets left for the kirtan – see the online shop. Bhakti is also the theme of the month in class for the whole of February.